I'll admit I went through a number of ways to style these pants with my sister before finally settling on this outfit. I tried a white tee, denim jacket and booties for a more casual weekend look; a cropped black and white sweater with black wedges for a more structured look and finally some minimalist sandals and this bell sleeved denim top. I love the way the shapes of this top and pants mimic each other and the fabrics create a fall boho outfit. Last week, we loved the way Samantha from Gold Coast Girl & Kelly from Birdie Shoots styled their fall fabrics. Love this chic look Michelle! I might need to get some suede pants myself. Thanks so much for the link up! Wow...I would have never thought to get some suede pants---but these are da bomb!! You look absolutely wonderful in them!! Aren't they the coolest?! THey look so modern too! Digging this denim top, babe! Ohhhh...I LOVE these two colors together! So fab, girlie! I cannot even tell you how much I LOVE this outfit! Seriously, one of my favorites on you EVER!!! Thanks so much!! I'm glad I decided on this outfit for these pants. It shows them off SO well! Such a fun look! I love that top! What a fun outfit! Loving the pink and retro vibes. This look is outstanding! 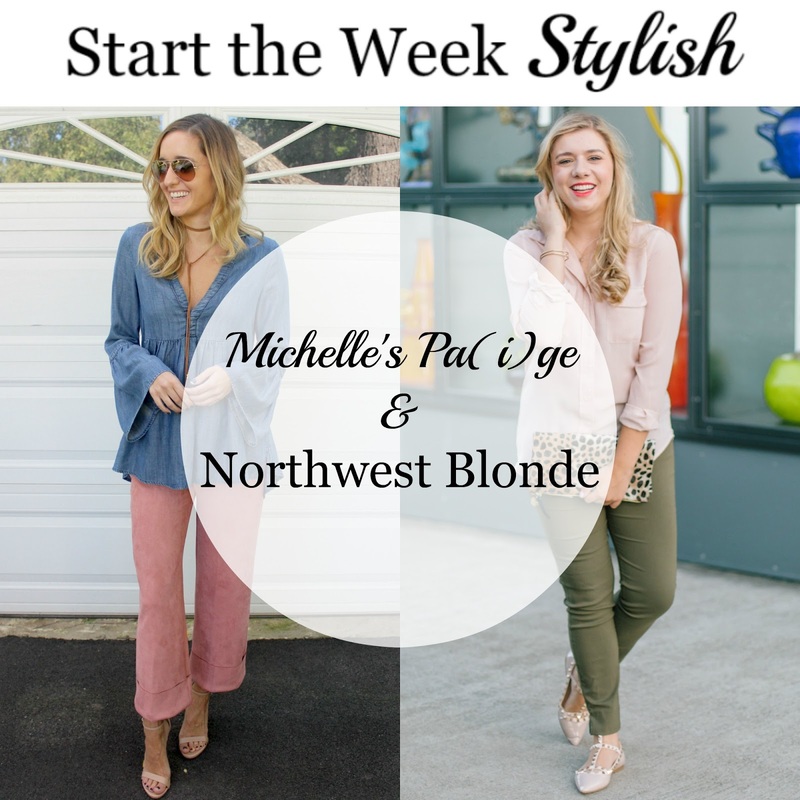 Love your chambray top, and those suede pants are amazing! I love these suede pants! They look perfect with the bell sleeve top for a fun boho look! Oh my goodness those pants are amazing! I love the boho vibe of this whole outfit! They are! So soft & they actually have an elastic waist so they are comfy! Those suede pants are so unique! I love the color of them and how you paired them with the bell sleeves! So boho! I just LOVE everything about this outfit! That ruffle chambray top, those pink suede pants... ahh! And the choker! Love, love, love! I would agree ... those are great pants. And the top is awesome too. Thanks for hosting. I loved those Zara pants and I wanted them to work on me so bad. Nonetheless you look amazing in em and the pairing with denim is so fab. DId you check out the matching top?! I just recently realized there is a suede top in pink. It looks divine! What a beautiful pair of suede pants, I love the shade!! I absolutely love the pairing of these two colors together! Looks great! Those suede pants are stunning and they look amazing with the denim top! I'd be scared of spilling something on them! Sounds like a fun post. I will be sure to check it out!